Photo: John Paul Filo/CBS ©2018 CBS Broadcasting Inc. All Rights Reserved. The Reagan family dinners will continue. 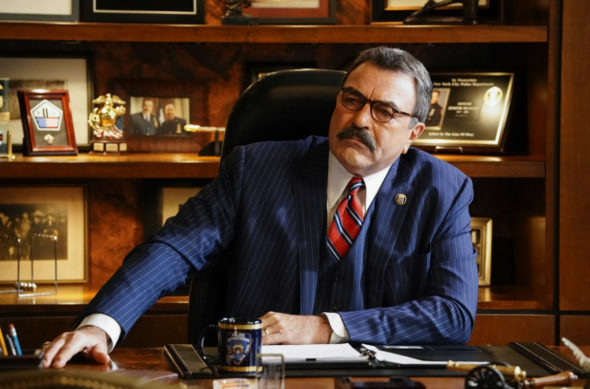 CBS has made a new deal with Tom Selleck and has renewed their Friday night drama, Blue Bloods, for a 10th season. In Fall 2019, the show will celebrate its 200th installment with its 10th season premiere. A CBS police procedural, Blue Bloods stars Selleck, Donnie Wahlberg, Bridget Moynahan, Will Estes, Len Cariou, Marisa Ramirez, Sami Gayle, and Vanessa Ray. The family drama centers on the Irish-American Reagans, a multi-generational clan of cops dedicated to New York City law enforcement. New York Police Commissioner Frank Reagan (Selleck) leads both the police force and his brood. What do you think? Are you still watching the Blue Bloods TV show? How long do you think this CBS series should continue? More about: Blue Bloods, Blue Bloods: canceled or renewed?, Blue Bloods: ratings, CBS TV shows: canceled or renewed? Blue Bloods: Is the CBS TV Series Cancelled or Renewed for Season Eight? My favorite! Even watch most of the re-runs! Love Blue Bloods! As long as they want to come back and do the show, I’m going to watch it! Blue Bloods is the best show on tv. Hopefully it will be around a long time…never ever miss a show! Great writing and acting!! Keep up the good/great work CBS. Lots of people that I know will be happy. Congrats to all the fans. I love to watch Blue Bloods and would love to do so for years to come. paint me HAPPY HAPPY!!! Love Blue Bloods! I wasn’t very sure when it debuted in the midst of a host of New York set crime dramas, but with Tom Selleck, I gave it a try and have been loving it ever since. Was not happy about Danny’s wife’s death though. Love the whole cast and hated to see her gone. Thank you for continuing Blue Bloods. It’s interesting, good family show, with plenty of drama without being as gruesome as some of the others. One of the best shows on TV. My wife and I never miss it. Great news, glad CBS sees a great balanced family and show is still wanted in this day of dysfunctional sitcoms and shows.